By Peter Anderson 9 Comments - The content of this website often contains affiliate links and I may be compensated if you buy through those links (at no cost to you!). Learn more about how we make money. Last edited August 28, 2017 . I was reading the blogs in my reader this morning when I came upon two similar posts. The original one by My Two Dollars talked about how some readers had asked to see what David's home office looks like. 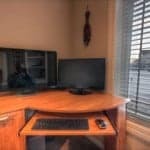 He complied by posting pictures showing his very neat desk, big beautiful monitor and beautiful mountain view out of his window. I'm jealous of that view since my home office is in our basement. Jim at WalletHacks read the post and decided to share some pictures of his office setup as well. His desk was slightly messier, and a more “lived-in” look. He also had several monitors on his desk. I'm jealous, I want a multi-monitor setup! I thought it was kind of a fun exercise, so I decided to participate. My office space isn't nearly as exciting as the ones linked above, it's just an available corner in our basement. In any event, here it is. My basement home office in all it's glory! As you can see I've got a nice hardwood desk, with filing cabinet, with the computer and other accessories all around. The desktop computer sits underneath the desk with about a million tangled power and USB wires snaking everywhere, a USB hard drive on top of the computer and a printer on the filing cabinet. I've got a nice big window right next to the desk that looks out into our recessed window well. For a basement it actually gets quite a bit of natural light down there since these windows and wells are so big. From time to time frogs like to jump into the well so I'll be typing at night and hear a tapping on the window – the frogs trying to get back out of the well (unsuccessfully). 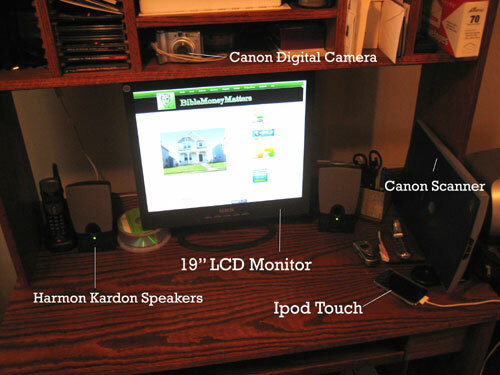 On the desk top itself we've got the 19″ LCD monitor, some nice Harmon Kardon speakers, a Canon scanner as well as my always in my pocket Ipod Touch. Of course there is also the trusty digital camera, cubby holes for envelopes, bills, CDs and other accessories. Since my home office also happens to be in our home theater/entertainment room I have plenty of distractions available to me. 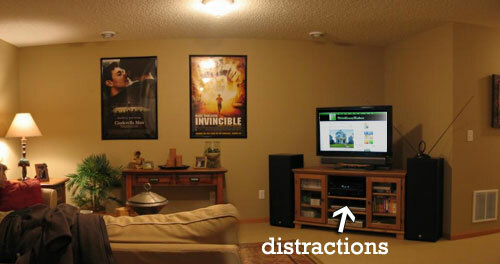 If I'm set on not being productive there is a home theater, and an Xbox 360 that i can spend hours doing nothing on. The couch is also way too comfortable (thanks Ikea!) so I have been known to lay down for a quick nap every once in a while. It's a little dangerous. What does your home office look like? Take a couple of pictures, post about it and leave us a link! Right now my home office consists of me and the laptop sitting on the couch. 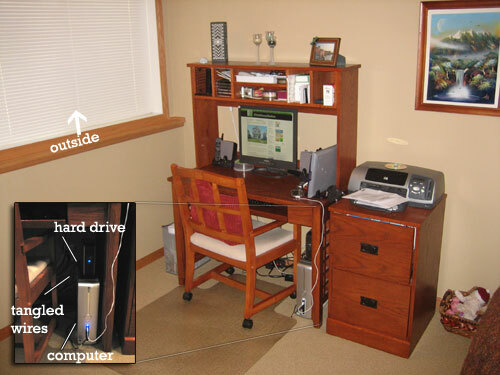 Don’t let their home offices get you down, your post was much more informative and detailed. Ah, you might not my view but you have a nice TV to watch down there! Thanks for sharing! Great movie posters… Invincible was a phenomenal movie. Yeah, we loved that movie – although that Invincible poster has now been replaced by a poster for the show 24. We went to a 2 hour premiere at a local theater and got a cool poster with Jack Bauer holding a machine gun. I’d like to upgrade to a nice 22-24″ Widescreen, but that may be a while. I second Jim’s comments on the movie posters. Cinderella Man would be a timely movie for those who have never seen it before. A great reminder than we are in fact not in “unprecedented” times, economically. It has been much, much worse, and we should be thankful it isn’t that way now, despite government’s best efforts to drag us there. I digress…sweet set-up, Pete! Cinderella Man has a strange title, but it really is a great movie, one of my favorites. It tells the true story of a depression era boxer who thinks he has fought his last fight. Struggling to get by he gets one last chance to make good. Touching and very timely for our current hard economic times. Must see! (there’s my mini-review for everyone.